Welcome to Volume Two of Waiting for Wednesday! It's All-New! All-Different! 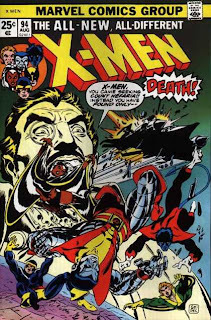 We've killed off, like, all of your favorite heroes (and a villain or two), and we plan to bring (most of) them back as less-popular, though still-a-little-bit-recognizable (so as to cash in on their marketability), knock-offs in the very near future! They'll have insanely difficult to follow new origins, and their actions and decisions will be steeped in decades of cloudy and confusing continuity (that may or may not have even existed!). Oh, and we plan to ship each week with--at a minimum--four different covers, each one more "limited" than the one before it. Now that our first year of WfW is behind us, I can promise a few new things for the New Year. Well, okay, fine, that's not entirely true. Actually, it's not even a little bit true. Waiting for, Volume Two (or, as the cool kids are calling it, "The Deuce"), will be very much like Waiting for, Volume One. 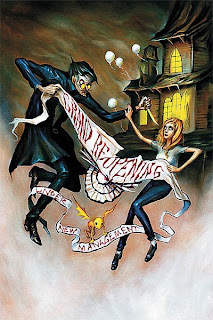 Each week at this time, I'll run down a short list of comics that I'm anxiously awaiting to purchase at the old comics shop, and I'll provide witty, hilarious, and sometimes even thoughtful and moving, commentary throughout. Oh, and sarcasm. There'll be that, too. As always, I'll try to mix things up a bit with my weekly selections, as I tend to read both mainstream books and off-the-beaten-path titles that many fans might not even be aware of. So, with that (second) preamble out of the way, let's get to this first Wednesday of the year's comics. The biggest book of the week is undoubtedly Marvel's Siege, issue one, which is the first in a four issue mini-series from the publisher. Now, I have to be honest here. I am very far behind in my Marvel reading. This past weekend, I made a point of it to sit down and try to catch up on my books, and while I made some headway in that regard, there's still quite a ways for me to go. My backlog of comics has reached a stupid level, and as a result, I'll probably be buying many more trades than single issues this year. And, because of financial...um...situations...this may finally be the year that I actually stick to that resolution. This is Marvel's big event for the New Year, and it's written by Brian Bendis with art by the fantastic Oliver Coipel (House of M). Siege promises to be the culmination of Marvel's big events over the past few years and it will likely lay the foundations for the post-Secret Invasion landscape, so there's plenty of hype surrounding the project. 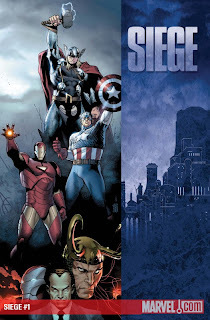 Beginning with the ravaging affects of Avengers Disassembled and following the aftermaths of House of M, Civil War and Secret Invasion, culminating with the evil Reign of Norman Osborn, the Marvel Universe has been left with its greatest villains holding more power and control than ever before. On the brink of madness, Osborn, in his final bid to take total control, targets the final obstacle in his mission...Asgard. Events are set in motion forcing our heroes to put aside the deep rifts that have grown over the past seven years. See? What did I tell ya about the culminating? Siege will be a big, important title for the next few months, and anyone with even a passing interest in the current Marvel Universe should probably check this issue out to see what the immediate future will hold for the characters. Even so, for my money at least, the best Marvel book shipping this week is the clunk-ily titled, Ultimate Comics: Spider-Man, issue six. Also written by Brian Bendis, this series is, simply put, something special. Much like he did throughout the critically acclaimed and commercially successful first volume of the title, Bendis has brought a new, interesting, and utterly engaging take on Spider-Man to volume two. I've had the first four issues of this series piled up somewhere in my stack of unread books, and I finally read through them this weekend. Personally, I dropped the first series after Mark Bagley left as its ongoing artist. Not because I had anything against his replacement--the incredibly talented Stuart Immonen--mind you, but it was more because I was looking for an excuse to drop a monthly book. I figured I'd collect the series in trades. Which, of course, never happened once I couldn't afford to buy as many trades as I used to. Still, before the big Ultimatum event hit the Ultimate line, I had stopped reading the titles across the board. And I can honestly say that I missed Bendis' Spidey, and I'm glad I decided to give this new volume a shot. Bendis always works with the best artists in the business, and he often introduces mainstream readers to the work of various indy artists. In the case of this latest incarnation of Ultimate Spider-Man, David Lafuente is certainly one of the finest artists Bendis has ever worked with. And that's saying something. 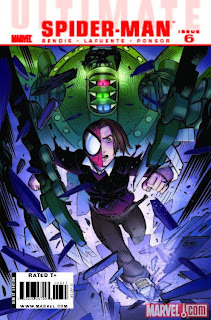 Mysterio has had just about enough of Spider-Man, so he sends in the ULTIMATE SPIDER-SLAYER...and sends it right to Peter Parker’s school! All this and the mystery of the Shroud is finally revealed!! Join rockstars BRIAN MICHAEL BENDIS and DAVID LAFUENTE as we swing into the final chapter of this thrilling arc! Since this is the final issue of the first arc, I'd suggest trying to find the first issue, flip through it, see if you dig it, then wait on the trade and buy that. But that's just me. Moving right along. The award for the most interesting title, though, from Marvel, goes to a book I know NOTHING about. I just saw the cover image on Marvel's Web site five minutes ago. It's an import book, and it's called Daffodil, and it's about vampires. That's all I know besides what the cover looks like. THE STORY: Addio-Colonnello is a distant town, a port beyond the oceans, many moons away from our Bohemian lands. Tragedy strikes when Nosferatu launches his assault, commanding his legion of vampires to descend upon this town. Sounds different, I'll give you that. And the cover is drawn by the interior artist, and it's kinda different and cool. That six dollar price point's a killer, but these books are pretty packed with content. The other Marvel imports have all pretty much been the size of two (or three!) typical, American comics, so you're certainly getting your money's worth. Still, since I know next to nothing about the book, I can't really say much more than I'm going to flip through it in the store and see if it's my thing. 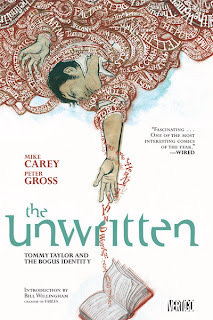 One book that I have absolutely no reservations in recommending is The Unwritten. From Vertigo--who had a banner year in 2009, by the way--comes the trade paperback of volume one of the Mike Carey-penned series. And, because Vertigo is Vertigo, they are releasing this first volume for the insanely low price of $9.99. I've been screaming about this series all year, and now's the perfect opportunity for a new reader to hop on and give it a shot. I know from the comments we get that our readers are incredibly well read over a wide variety of genres, and I think this book will put smiles on a lot of faces. I'm so confident, in fact, that I will give this book the Official Exfanding Seal of Approval. "A wish-I'd-thought-of-it premise, beautifully executed. Highly recommended for anyone who thinks that fantasy can do more than just help you escape the real world." "Fascinating...one of the brainiest and most interesting comics of the year." Tom Taylor's life was screwed from the word go. His father created the mega-popular Tommy Taylor boy-wizard fantasy novels. But dad modeled the fictional epic so closely to Tom that fans constantly compare him to his counterpart, turning him into a lame, Z-level celebrity. When a scandal hints that Tom might really be the boy-wizard made flesh, Tom comes into contact with a mysterious, deadly group that's secretly kept tabs on him all his life. Now, to protect his life and discover the truth behind his origins, Tom will travel the world, to all the places in world history where fictions have shaped reality. From Bill Willingham to Ed Brubaker, from the LA Times to Ain't It Cool News, THE UNWRITTEN has won over fans, critics and pros. Now, don't miss the first collected edition featuring the first five issues of the overwhelmingly acclaimed Vertigo series. Seriously, folks, give this book a chance if you haven't already. And, finally, we come to the last book in this, the groundbreaking first issue of WfW, Volume Two. Also from Vertigo, issue 21 of House of Mystery. Behind The Goon, this is probably my favorite book out there today. For horror fans, there's really no better title on the stands--especially not from the big publishers. And this week's issue promises to be new reader friendly. A new era for the House of Mystery begins as Fig reopens the bar to the public. But where's Harry? What's Cain doing here? And what are those things floating in their dusty jars? This is a stellar jumping-on point for new readers featuring a story illustrated by Sergio Aragones about...oh, what do you care what it's about? It's Sergio! House is where it's at, and the combination of the Bill Willingham/Matt Sturges writing and the amazing Luca Rossi art has made for a perfect comics reading experience. If you want to try the book, this issue is probably a decent place to start, but I'd suggest picking up the first trade--which, of course, Vertigo offers for the same, low, low price of $9.99. That brings us to the conclusion of the first Waiting for Wednesday of the New Year. Here's to the next 51 weeks of blogging, and here's to the next 51 weeks of good, intelligent comic books. That's my bit for the day. So, what are you Waiting for? One book I've been surprised that you've never mentioned is DMZ. DMZ and Y the Last Man go together in my mind for some reason; they both had extremely good runs and then so-so runs, but I think they're both worth reading again. Vertigo was the first non-Marvel/non-DC company to thoroughly impress me with story quality, and those two comics are a large reason why. You know, I always hated how comics would arbitrarily change volumes just for the sake of an "issue one," but then later, equally arbitrarily change back to the old volume/issue numbering. It's a needlessly confusing gimmick. While I've never read DMZ (but I have heard some really good things), I am currently reading Y in trade. Well, actually, I'm reading it in hardcover, really. The first two Deluxe Edition hardcovers are out, and I've read thoses, so I'm anxiously awaiting Volume Three. I think Y is one of the best books of the last decade. Maybe I'll pick up the first DMZ trade--you have a sense of some of the books I read. Do you think I'd like it? I'm not entirely sure about your tastes, but DMZ is certainly a good book with solid writing. The first issue of The Siege was less illuminating than I would have hoped, honestly. It feels really contrived and seems like it'll just be fight scene after fight scene for the sake of some cool eye candy. The checklist for this latest event really did make me groan, too. It's way too long. It seems like Marvel took a great idea with Dark Reign, and then just dragged it out far too long. I think if Siege had hit around six months ago, it wouldn't feel so...burdensome for readers.